1. Who were the early British Radicals? 2. Agitation for political reform. Political rights by virtue of being a person as opposed to being a landowner. 3. Peaceful protest feared by authorities as a potential revolutionary starting place. 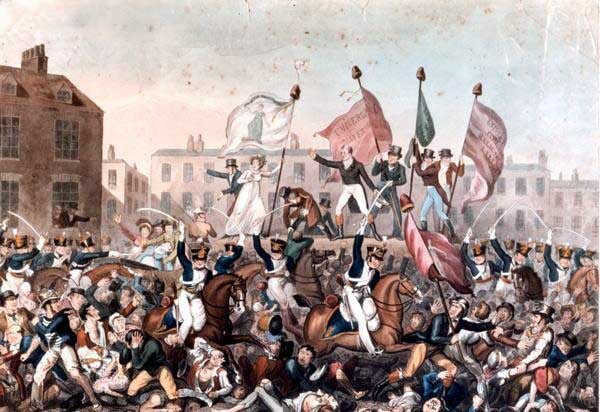 The Peterloo Massacre. 4. The Reform Crisis: the fall of the government and the creation of a coalition government. A sense of betrayal to the working man. 5. How serious a threat to governments were the agitations of the early 19th Century? The growth of towns and the urban workforce. 6. The Assassination of Spencer Perceval - the Cato Street conspiracy. This resource is free to all registered basic users. Please Login or Join the HA.